Well my latest poll has ended and the results are not really a surprise. 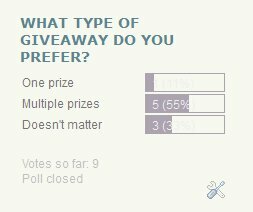 Most people prefer giveaways with multiple prizes. More chances to win, I guess. Which is always good. That’s how I run my giveaways. One giveaway with multiple prizes, instead of many giveaways with one prize. It’s easy to host them this way. I don’t have a new poll up because I can’t think of what else to ask right now. I’ll let you know if I post one though.